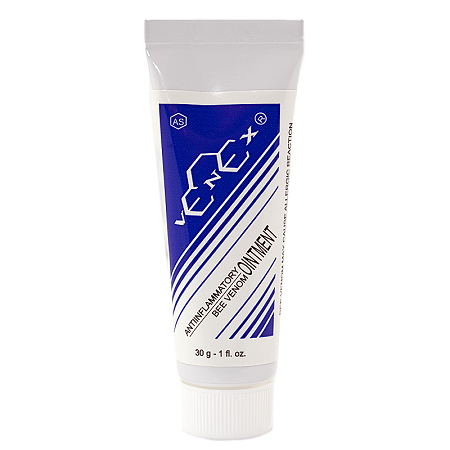 A typical application is that a small amount of the VeneX Ointment is added to a night cream and applied on the face. The ratios of the VeneX Ointment and night cream are 1:5 to 1:10. In this concentration the cream can be left on the face over night and washed off next morning. Two weeks of continuous use with a one week break between applications is recommended. Avoid contact with eyes. It must be emphasized that the degree of skin reaction does not necessarily correlate with the clinicial result that would be obtained by applying a cream to the area of a joint and rubbing it in. I tried the Venex Bee Venom ointment to see if it could help with nerve damage in my feet and right knee. Although it is not a miracle cure, it IS surprisingly effective. Every three to four days I rub some onto both of my feet and right kneecap and experience mild tingling/warming within a few minutes. Although this definitely doesn't remove all of the pain, it helps a great deal while the ointment is on and the effects linger for days even after the ointment has been washed away. Be patient with this--and don't expect a miracle or instant cure--to ensure you're pleased with the results. Love the Venex bee venom! Not sure how it works, but it really helps my upper back and neck. I realize that it's not a cure for my back issues, but it helps to relieve the intense pain, which in turn helps me to relax. Wonderful product. I use this ointment to relieve the neuralgia resulting from shingles. It works as a counter-irritant and is very effective in providing temporary relief. I have tried numerous remedies, all kinds of creams, gels, ointments, salves, oils, etc. and have found this Venex the most effective, though not as a cure. But nothing so far has cured this neuralgia; I have tried injections of various substances, acupuncture, homeopathy, cayenne, freezing and even actual bee stings of live bees - really, apart from cutting my head off, I seem to have run the gamut of attempted cures, without success. Now I have to rely on Old Father Time to help me out. But meanwhile, I like Venex, which generally stings and reddens the skin, so one gets the impression that the ointment is at least trying, and then I feel better! By the way, It is less expensive on this site than anywhere else. This is the second time I have bought and used this cream. It's very powerful and does help stop arthritis pain. The numbing effect begins very quickly and a little goes a long way.